The west coast has been very settled for a week now, and the good weather is likely to continue into next week. There are huge schools of albacore and skipjack tuna right in front of the bar out to 80m. The marlin are there too but not with every school, and they are in close. You need to get your lures in the water before you hit 50m or you will be missing fish. 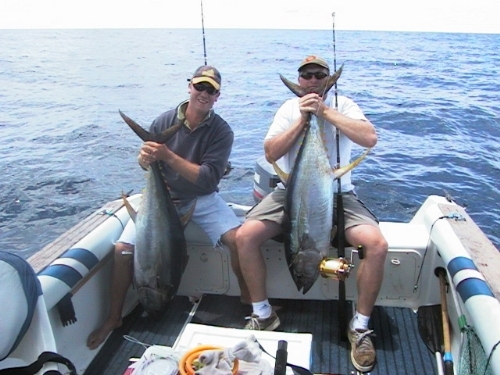 Skipjack make great bait for snapper and gurnard, but albacore are better for the table. To be table-worthy, albacore need to be bled, which is easily done by cutting through the lateral line or just below it, immediately behind the pectoral fins. Put the fish straight on ice, and you will have some great tasting treats. After seasoning just sear the outside, so most of the flesh is still pink. It is also very nice smoked. Overcooked tuna is dry and bland so be careful you don't do it! It's also tasty served raw with soy & wasabi. To catch tuna, you need some solid gear such as a heavy snapper set, 10 to 15kg line and a 100lb trace with a small tuna lure attached. You will catch them on marlin lures but dedicated tuna lures around 75 to 100mm long work best. You can but them pre-rigged for around $20. Set them 10m to 30m out the side of your boat and tow them at 6 or 7 knots. Make sure the reel drag isn't set too high as they hit lures hard and make sure the reel clicker is engaged otherwise if you aren't watching you will get spooled, and a bust rod is a likely outcome. Snapper fishing is better than I would have expected for this time of year over the coast and you can find fish in as close as 10m or on the way out to 60m. If you are fishing in close be very mindful of the swell and let out lots of anchor rope. You will also find kingfish in close and under workups. The harbour is also fishing very well with most snapper around 30 to 35cm, making for great eating. Trevally are also abundant, and they are suckers for small baits of squid and/or skipjack fished on a strayline in shallow water. The banks around the Tripod are a good place to start. It is best that you use a landing net too as they tend to fall off hooks when lifted straight out of the water. They are hard fighting fish and are very nice when smoked. Gurnard remain elusive but expect that to change once the water starts to cool down. May is traditionally the month when gurnard fishing starts to take off in the harbour.